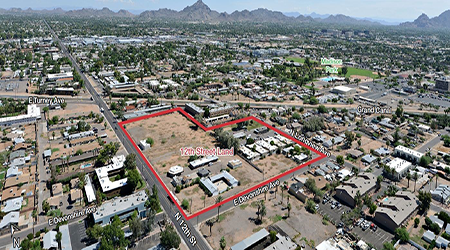 PHOENIX, ARIZONA – The $7 million sale of the largest multifamily-zoned land holding in Central Phoenix highlighted recent deals negotiated by NAI Horizon professionals. NAI Horizon Vice President Kim Kristoff represented Sidney M. Rosen as trustee on behalf of a lifetime grouping of partners and trust beneficiaries. Kim Kristoff negotiated the sale of a 7.01-acre parcel of land, representing the seller, Sidney M. Rosen, Trustee, for $7 million. The property is located at the NEC of 12th Street and Devonshire Ave., Phoenix, AZ. Brian Gausden with Western Retail Advisors represented the buyer, DECO Acquisitions, LLC. Matt Harper negotiated the sale of a 2,789 SF retail property, representing the buyer, The Chahoud Family Trust, for $375,000. The property is located at 2829 E. University Dr., Mesa, AZ. Brad Broyles with AZ Real Estate Options represented the seller, CAB Holding, LLC. Tom Bean, CCIM, negotiated the sale of 1,239 SF office property, representing the buyer, Iscandar, LLC, for $272,580. The property is located at 1095 W. Rio Salado Parkway, Tempe, AZ. David Bean with Commercial Properties, Inc. represented the seller, James J. Lemon as PR for estate of Julie Lemon. Tyler Smith represented the tenant, Magnus Title Agency, LLC, in a 76-month office lease for 5,150 SF at 2425 S. Stearman Dr., Chandler, AZ. Todd Noel with Colliers International represented the landlord, Stearman, LLC. Chris Gerow, Shelby Tworek, Gabe Ortega and Patrick Anthon represented the tenant, Luxe Nail Bar, in a 7-year retail lease for 1,360 SF in Scottsdale Quarter, located at 15147 N. Scottsdale Rd., Scottsdale, AZ. Carol Schillne with CBRE represented the landlord. Tyler Smith represented both the landlord, HF1-D Phoenix 1706, LLC, and the tenant, SSCW Corporate Office, LLC, in a 63-month lease for 6,448 SF at 1830 N. 95th Ave., Phoenix, AZ. Tyler Smith represented both the landlord, Pacifica Palm Valley Center, L.P., and the tenant, U. S. Army Corps of Engineers, in a 60-month lease for 2,738 SF at 1626 N. Litchfield Rd., Goodyear, AZ. 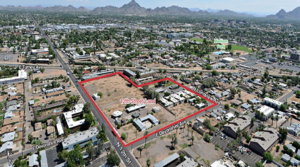 Chris Gerow, Shelby Tworek, Gabe Ortega and Patrick Anthon represented the landlord, Glendale Center, LLC, in a 120-month land lease for 990 SF at 5080 W. Olive Avenue, Glendale, AZ. Tim Hurlery with JLL represented the tenant, USAA Federal Savings Bank. Tyler Smith represented the tenant, Millenium Title Agency, LLC, in a 76-month office lease for 1,191 SF at 2425 S. Stearman Dr., Chandler, AZ. Todd Noel with Colliers International represented the landlord, Stearman, LLC. Stan Matzinger and Tom Bean, CCIM, represented the landlord, 10240 Bell Road Associates, LLC, in a 48-month office lease for 2,806 SF at 10240 W. Bell Rd., Sun City, AZ. Chris Gerow, Shelby Tworek, Gabe Ortega and Patrick Anthon represented the tenant, Squeezed Arizona, LLC, in a 60-month retail lease for 1,600 SF at 14891 N. Northsight Blvd., Scottsdale, AZ. Michael Achtman with ORION Investment Real Estate represented the landlord, Northsight Scottsdale Crossing, LLC. Isy Sonabend represented the landlord, Grimco, Inc., in a 35-month industrial lease for 5,016 SF at 23910 N. 19th Avenue, Phoenix, AZ. 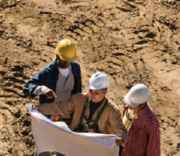 Chris Gerow, Shelby Tworek, Gabe Ortega and Patrick Anthon represented the tenant, Total Tractor, LLC. Chris Gerow, Shelby Tworek, Gabe Ortega and Patrick Anthon represented the landlord, New Bell Tower, LLC, in a 60-month retail lease for 1,080 SF at 4915 W. Bell Rd., Phoenix, AZ. Matt Harper represented the landlord, Yee Legacy II, LLC, in a 60-month retail lease for 1,152 SF at 18914 E. San Tan Blvd., Queen Creek, AZ. Matt Harper represented the landlord, Elmo Tari Trust, in a 60-month retail lease for 1,335 SF at 12235 N. Cave Creek Rd., Phoenix, AZ.